Home » Blog » trash » Worth Sharing: "Trash-tastic!" When I moved, I left my disgusting old trashcan behind. 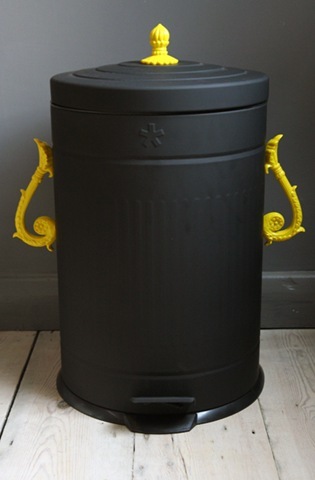 So when I saw this one, I thought that it’s exactly the type of garbage can I should have at the new house. Unfortunately, it’s £110 and is found through Rockett St. George, a British company, so it doesn’t look like I’ll be chucking my trash in it any time soon. However… I am a clever gal and with some Fypon architectural details and a slap of paint, I could whip one up on my own! This gem of a post is quoted from a Southwest Baltimore neighbor at the Pigtown Design Blog. Check out this fascinating Baltimore-based design blog which takes a look at architecture, design, books, gardens, and other things that interest and catch the eye of the author, Meg Fairfax Fielding.